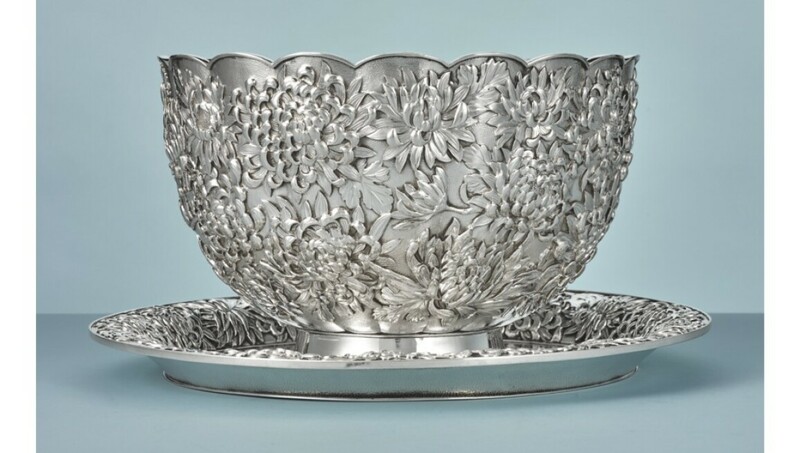 Spring is on its way in New York and we have chosen an array of objects from the Style: Silver, Ceramics, Furniture sale that use a floral motif. From teapots to tables and candelabras to chairs, these wonderful objects will let help you celebrate spring in style. The sale is now open for bidding. A Théodore Deck Faïence Turquoise-Ground Large Centerpiece. Estimate $12,000–18,000. A Set of Sixteen German Hand-Coloured Engravings of Tulips by Johann Wilhelm Weinmann (1683-1741) from Phytanthoza Iconographia, Regensburg, circa 1740. Estimate $6,000–9,000. A Pair of Louis XV Parcel Gilt White-Painted Louis Fauteuils by Tilliard, Mid-18th Century. Estimate $5,000–8,000. A Pair of Italian Silver Eight-Light Candelabra, Gianmaria Buccellati, circa 1975. Estimate $30,000–50,000. A Group of Royal Copenhagen 'Flora Danica' Wares Mid-20th Century. Estimate $3,000–5,000. A Pair of Gilt Bronze-Mounted Meissen Porcelain Bouquetière Figure Three-Light Candelabra, 18th Century, The Porcelain Modelled By Kändler and Later Decorated. Estimate $5,000–8,000. A Three-Piece Danish Silver Blossom Pattern Coffee Set with Tray, No. 2, Designed by Georg Jensen, Georg Jensen Silversmithy, Copenhagen, 20th Century. Estimate $8,000–12,000. A Louis XV Carved and Green and White-Painted Console Table, Mid-18th Century. Estimate $6,000–10,000. A Meissen Teapot and Cover circa 1745. Estimate $5,000–7,000. A Meissen Teabowl and Saucer circa 1745. Estimate $2,000–3,000. A Pair of Paris (Honoré) Porcelain Square-Section Planters circa 1840-60. Estimate $1,000–1,500. A Mexican Silver, Copper and Hardstone Centerpiece and Matching Pair of Three-Light Candelabra, Emilia Castillo, Taxco, circa 1995. Estimate $6,000–8,000. A French Silver and Mixed Metal Four-Piece Tea Set With Matching Tray, Christofle & Cie, Paris, circa 1880. Estimate $20,000–30,000. A Pair of Louis XIV Walnut, Boxwood, Sycamore, Fruitwood and Scagliola Marquetry Panels by Thomas Hache, Grenoble, Late 17th Century. Estimate $15,000–25,000. A Japanese Export Silver Punch Bowl and Stand, Samurai Shokai, Yokohama, circa 1910. Estimate $6,000–8,000. Two Victorian Silver Fruit-Form Teapots, Barnard Brothers and Charles Fox II, London, 1837 and 1840. Estimate $4,000–6,000. An Assembled Extensive Royal Copenhagen Part-Dinner and Dessert Service Late 18th-Century and Later. Estimate $20,000–30,000. A George III Silver Figural Taperstick, John Schuppe, London, 1765. Estimate $2,000–3,000. A French Louis XV Silvered Bronze Pentagonal Lantern Decorated with Continental Porcelain Flowers and Green-Painted Metal Trelliswork, the Lantern Mid-18th Century, the Flowers and Metalwork 18th Century and Later. Estimate $20,000–30,000.